Everything was fabulous! You are such a hit at our events! The pork was superb, thank you for the sauce and there was plenty for everyone! 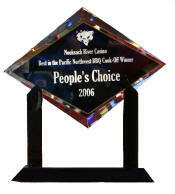 You know that you will always be one of the front runners as a caterer with us! You’re product has never disappointed us EVER! TaTu BBQ is tru ly great food. Pat Momany is a true Boucanier. Pat not only cooks great food, but also supports the Fisher House Program and gives back to our wounded troops by using his proceeds to fly to Germany every year to feed the troops. Pat also passes on his knowledge about smoking by teaching BBQ school. I attended one of his classes and learned a lot. Pat is a quiet and modest person and is definitely a candidate for the Best of Western Washington. Spent 10 years in Texas and found TaTu BBQ to be a match for Texas BBQ right here in Kingston. I stopped by your bar-b-q table outside a café a while back and have to say your pulled pork sandwich was and is the best by far I have ever tasted! Congrats and keep up the hard work! Nothing compares…even down south! I bought a smoker last year and still cant master the secret! I’m very inspired by your accomplishment and so is the fam! Everyone thought the BBQ was great. We didn’t really have that much left over. When are you open so we can return your stuff? Having the BBQ allowed everyone to serve themselves and we didn’t have to serve it. All in all it worked out quite well. Thanks again for your help. Hi – first of all, thank you very much for the wonderful service. I just heard back yesterday from some of the branch folks. They were thrilled and mentioned how great the food was, so we really appreciate your help in putting this together for them! I think you’ll have some of those branch folks stopping in more often for BBQ! It was such a hoot! We had more people show up…but guess what?!?!?!? There was so muc h food, that there was still a whole pan of pork left!!!! (I was PERFECTLY FINE with that!) Everyone loved your food! And Marty showed up with his BBQ-he brined his chicken legs again…YUCK!!! why does he have to do that?!?!?! they were soo salty that I instantly puffed up after one bite!! (ok, I exaggerated a little!) The band was awesome! There were road guys square dancing and they LOVED it! Everyone had perma-grins on their faces-it was like a dream! thanks so much for helping me out! I will be heading over that way to see my bro…when he has a day off!! If I can’t make it, I will send the bottles with my mom, she lives there in Keyport! talk to you soon!!!! Do you have a Traeger demo grill or a client that would be willing to lend a grill for a charitable cause to my friend Pat Momany an award winning BBQ master who is going over February 8th (2006) to cook for the families at the Fisher House in Landstuhl, Germany. The opportunity for me to get involved with this cause just came about last week , as I hadn’t seen Pat for a while and I’m finding the shipping to be difficult and I don’t know if I have enough time. So that is why contacting you. Pat was raised in Germany and looks forward to going back. He truly is a BBQ master, I’m going to his BBQ school this week end and he is going to do them at my shop in the spring. There will be good photos for promotion coming from this event. I look forward to hearing from you and I’d like to thank you in advance for any help you can provide for this worthy cause. 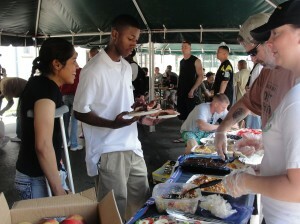 Thanks for sharing your pictures of the wounded troops overseas in Landstuhl. I hope you had a good time in Germany. I still get comments from my cousins about the good food they had. Pat, I wish I had a penny for each time I have thought of you in the last 10 days!! I am so sorry you got sick the second week! 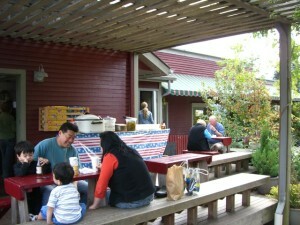 It was such a great cookout and the food was wonderful!! You put so much heart and soul into it and we really appreciate it! I hope that you enjoyed your cousin and seeing Landstuhl again. I think you did. 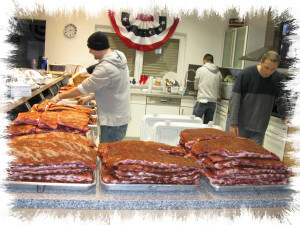 Robert and I will be using your rub and BBQ sauce this Sunday when we did a beef brisket for Astrid and the film crew! They send their best regards! Robert enjoyed his day with you at the school! By the way, thanks for the cute thank you card…it was my pleasure! The pictures came out good…there are a few fuzzy ones, but some good ones as well! Hope your trip home was as smooth as possible…it is a long one! Your dinner was fabulous and the reviews from everyone were over the top. It was a very nice event. Thanks to you and Steve for taking charge.